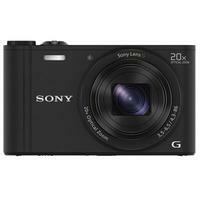 The Sony Cyber-Shot WX350 in black is a high-end digital compact camera with versatile 20x optical zoom lens, high image quality and advanced noise reduction technology. The back-illuminated Exmor CMOS sensor delivers beautiful 18.2 effective megapixel resolution, while the BIONZ X engine ensures 3x faster processing than the previous BIONZ processor and more detailed reproduction of high-quality images. In addition to the above, the Sony WX350 also features Wi-Fi and NFC connectivity, Full HD movie recording, 4K still image output via HDMI socket, Picture Effect mode and 360 Intelligent Sweep Panorama.